England are facing a very big challenge to win this game. They'll say they can do it, of course, but they are going to have to play much better than they have done all winter. What was different from the series in the United Arab Emirates was that they tried to impose themselves. You can excuse Alastair Cook's dismissal, anyone can get a good ball early on, but the rest were misjudgements and poor decision-making, not all against spin. "England's problems are mental rather than technical. Speaking from my experiences, once you get a confused and clouded mind, your decision-making can be poor." 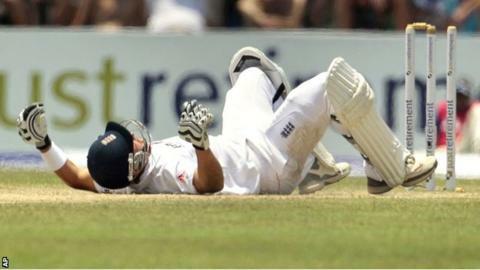 Kevin Pietersen's shot was very extravagant, especially to the first ball he faced after lunch. He might say he was unlucky to get an inside edge but if you play like that, driving with a huge gap between bat and pad, you are asking for trouble. Today's performance, on what was not a minefield, wasn't good enough and will not have gone down well at England HQ. It was cavalier. They were rattling along at four runs an over, which was the wrong approach. It needed sensible, careful batting - yes with positivity, but not recklessness and pre-determined, unconventional shots, which is how I would term the sweep. England have four Tests in India next winter and need to go out there and win. The selectors have to make their minds up and decide if these batsmen are able to cope, or whether new players will bring a freshness to the team. It makes no difference who scores runs against West Indies at home next summer, or even against South Africa later in the summer, good side though they are, it's who can apply themselves in the sub-continent. This is the fourth Test of the winter and England have not taken one to a fifth day yet - this one certainly won't go to five. Away from all the doom and gloom in the batting department it was good to see Graeme Swann back amongst the wickets. He got an early one and that always sets you up. He was back with his normal bounce in the field and was buzzing again. However experienced you are, or how good you are, searching for wickets is always difficult. There is a huge amount of character amongst the bowlers, not just Swann, but James Anderson, Stuart Broad and even dear old Monty, who could have shrivelled after dropping those two gaters on the first day, but he went out there and batted well - he will be OK. But the bowlers have every right to feel let down by their batsmen, who have not shown the same commitment and discipline in their work as the bowlers have in theirs. Quite simply, England now have to get the final five Sri Lanka wickets for less than 50 runs. They can all bat a bit and Chandimal can certainly hit the ball cleanly. England's batsmen are all capable of doing it, but at the moment it looks like it's going to be a tall order.